BOAC, Marinduque - Presidential Campaign Rally of Candidate Mayor Rodrigo Duterte along with Congressman Allan Velasco is set today, May 5 at Guingona Park, Gasan at 1:00 pm instead of Marinduque State College. 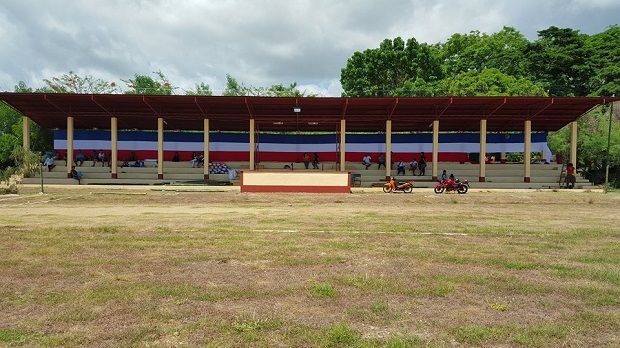 Just two days before the campaign rally, Duterte’s party set its campaign venue at the grounds of the Marinduque State College (MSC). An official of the Marinduque State College said Cong. Allan Velasco requested for campaign venue in their quadrangle last Monday, May 2 and was approved. However, immediately the following morning the approval of the venue was cancelled due to a reminder from the Commission of Higher Education (CHED) to State, Universities and Colleges (SUCs) on the “Participation in Partisan Political Activities” stated in a Civil Service Memorandum Circular No. 30, series of 2009). Directly or indirectly soliciting votes, pledges or support for or against a candidate and other similar acts which are considered partisan political activities and grounds for disciplinary actions. Further, it should be noted that public officials and employees who have been found guilty of engaging directly or indirectly in any partisan political activity during the election period will be penalized with dismissal from service with all the accessory penalties. MSC Official explained there was no influences made by any opposing candidates or parties on the cancellation of permit for Duterte’s campaign as what allegations on social media posted. The school was just following rules of CHED and the Civil Service. She even mentioned that prior to this, another presidential candidate went to Cavite State University and conducted a candidates assembly after which a case was filed. Three more days to go before election day and people still anticipate some political traditions during this time; taking out of tarpaulin or posters of another candidate; spreading news that would discredit the opponents, vote buying and others. The religious in the province urges the people every day, every mass to pray before going to the precinct to vote so that God would enlighten everyone on whom to vote and not to sell their votes so the Philippines could be in better administration.